Discussion of the California drought is not limited to California anymore. One topic that gets a lot attention (even a segment on The Daily Show with Jon Stewart) is almonds and their supposedly inordinate consumption of water. I love almonds. I east a handful of them (unsalted dry-roasted) almost every day. I love them almost as much as peaches, which are, as far as I can think about it, my favorite food of all. And guess what! The almond tree (Prunus dulcis) and the peach tree (P. persica) do not only belong to the same genus, but the same subgenus Amygdalus. I am not a dendrologist, or a biologist of any sort, but to me it seems unreasonable that two tree species of the same genus or subgenus would have drastically different water requirements. But I haven’t heard any complaints about peaches or plums or apricots or cherries. At any rate, I am willing to sacrifice some of my own water use if my doing so will help keep the Prunus crops growing. I know it’s unlikely, but there’s always the categorical imperative. One of the ways in which I can save a little water is, since I am also a big eater of pasta, by using a new product from Barilla called Pronto™. It’s a pasta made not just with wheat flour but also with semolina, and it consequently absorbs its cooking water, like rice or couscous. To cook 6 ounces (175 g) of pasta requires only 1½ cups (360 ml) of water, instead of the several liters for conventional pasta, and none of the water is wasted. And since you start with cold water, time is saved as well. Since to me pasta is pasta (I don’t care if it’s fresh or dried), the result is completely satisfactory. Bravo Pronto™! The eminent sinologist Victor Mair, a frequent contributor to Language Log, likes to post about linguistic oddities to be found on signs, labels, menus and the like that are written at least partly in East Asian Languages, especially when Chinese characters are involved. I have before me a box of cookies of the type called mandelbroyt in Yiddish (literally ‘almond-bread,’ sometimes anglicized as mandelbread). They are pretty much the equivalent of what are known as biscotti in North America and cantuccini in Italy, one of many instances where an Italian culinary term is used with a different meaning from what it has in Italian (latte, gelato, prosciutto, marinara, pepperoni…). The label seems to be bilingual. The Hebrew characters on the second line do, in fact, represent a translation of the English on the first line (kehilla is a Hebrew word meaning ‘community,’ and specifically, at least historically, the organized Jewish community of a city). But a translation into what? Reading from right to left, the first two words, השגחת קהילה, mean ‘supervision of kehilla’ in Hebrew. So far so good. The next character, ד, is a one-letter word pronounced [də] and meaning ‘of,’ but in Aramaic, not Hebrew! It’s a rule of Hebrew writing, by the way, that one-letter words (mainly prepositions, conjunctions and articles) are attached to the following word. This is not the case if the letters represent abbreviations, but then they must be followed by a period or an apostrophe; most notable are the abbreviations ’י and ’ה representing יהוה (Yahweh, which of course must never, never be pronounced). 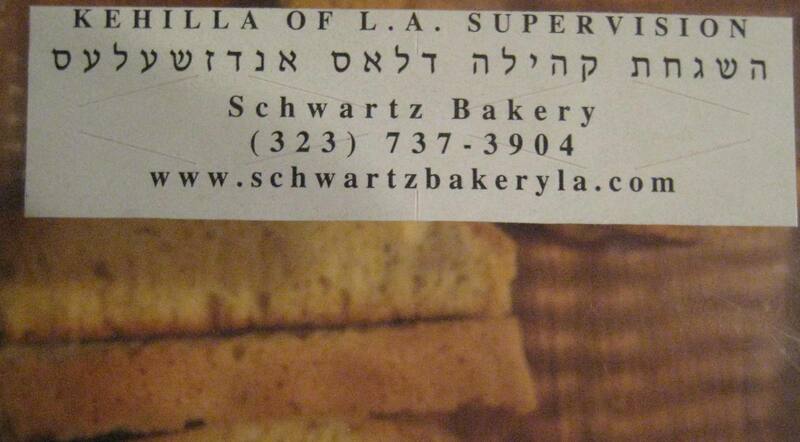 Now, what follows ד is לאס אנדזשעלעס, which is Los Angeles; but it is transcribed in Yiddish, not in Hebrew, in which it’s לוס אנג’לס. In the Los part, note that Hebrew uses ו (vav) and Yiddish א (aleph; strictly speaking it should be אׇ) for the vowel represented by o. In Angeles, Yiddish has ע (‘ayin) for the vowels represented by e while Hebrew does not show them. And, finally, for the “soft g” ([dʒ]) sound Hebrew uses ‘ג, while Yiddish uses the trigraph דזש (something like dzsh). So this simple-looking label is in fact quadrilingual! I like to think of myself as a kind of honorary Catalan. I have lived and worked in Barcelona; I have traveled around Catalonia, from the Ebro to the Pyrenees and from the Mediterranean to the Noguera Ribagorçana. I dance the sardana. I speak Catalan fluently and, what’s more, I write it “correctly” (that is, in accordance with the standard), something that most Catalans of my generation, their schooling under Franco having been entirely in Spanish, cannot do. And I love what Catalans consider their quintessential food: pa amb tomàquet (or, as colloquially pronounced in Barcelona, pan tumaca), literally “bread with tomato,” but actually bread (any kind of crusty bread, toasted or not) onto which the inside of a ripe tomato is pressed, followed by salt and olive oil. If the bread is toasted, garlic may be rubbed onto it. Once ready, it can be eaten by itself, as an accompaniment to dishes, or, most typically, as a base for sandwiches, open or closed, “mini” or full-size. The ripeness of the tomato is essential. Catalans use ripe tomatoes mainly for the purpose of making pa amb tomàquet (I have actually heard it referred to, pleonastically, as tomàquet per a fer pa amb tomàquet). For slicing and dicing (as in salads or English-style sandwiches) they prefer their tomatoes underripe, even green. I remember having a meal with a Catalan friend in Madrid, during which she complained several times about the ripeness of the tomato. The techniques of applying the tomato to the bread are varied. If the fruit is of a soft, juicy variety, it can be simply cut in half and pressed on the bread. Otherwise a grater or even a food processor can be used (the latter especially in restaurants). I have recently discovered an alternative way of making this delicacy. I don’t know if it’s original with me; I have not found in the twenty or so recipes I checked on the Web. I discovered it through good old mother necessity: I had no full-size tomatoes, but I had a basket of cherry tomatoes (of the Sweet 100 variety). I put a few of them, sliced in half (as many as would fit), into a garlic press, and squeezed, with the holes above the bread. Voilà! All the inside of the tomato came through, the peel stayed back, and I had the perfect beginning of pa amb tomàquet. After sprinkling a little salt on the tomato-covered bread, I did something different from the conventional pouring of the olive oil. This step is, traditionally, so essential that in Majorca the concoction is called pa amb oli (pronounced like pamboli), “bread with oil.” But while I love olive oil, I also love avocado, specifically avocado that’s ripe enough to spread on bread like soft butter. And this is what I like to do with pa amb tomàquet as an alternative to olive oil. I have served it done this way to Catalan friends, and, except for some kids, they have liked it. A few months ago I spent some time in Portugal, and learned that what the Portuguese call breakfast is pequeno almoço or ‘little lunch’ — a literal version of the French petit déjeuner and the Italian piccola colazione. But, in reading hotel reviews on booking.com written by Brazilians, I have found that their term for breakfast is café da manhã or ‘morning coffee’. To Brazilians, then, coffee is an integral part of the breakfast concept, as it is to Turks, whose word for breakfast is kahvaltı, a compound of kahve (coffee) and altı (six), possibly meaning (I’m not sure about this) ‘six-o’clock coffee’. Of course, at the Turkish hotels where I stayed breakfast was not necessarily served at six and one had a choice of coffee or tea. I was a morning tea drinker until I acquired the coffee habit in my twenties. And while I like my tea plain (no milk, lemon or sugar), I like coffee with (a little) milk. But with old age my digestion of milk seems to have slowed down, and if I do any vigorous activity (such as a gym workout) within two hours of drinking coffee with milk, I get an unpleasant sensation in my stomach. My routine is now tea on gym days, coffee on non-gym days. When I travel I ask for a cappuccino scuro in an Italian-type coffeehouse, or for un cortado in Spain or une noisette in France. In Colombia it’s another matter: there café by itself means ‘coffee with milk’; black coffee is tinto (which normally means ‘red’ as applied to wine), while the intermediate kind that I like is perico in Bogotá and elsewhere, but pintado in Cali. The word perico means ‘parakeet’ and it’s also used to describe scrambled eggs with tomatoes and onions, huevos pericos. One time, in a café in Cali, I asked for dos pericos, and was about to be served some eggs when I corrected myself and said dos pintados. Anyway, I am curious if any languages other than Turkish and Brazilian Portuguese have ‘coffee’ as a part of their term for breakfast. As of today, January 16, Two-Buck Chuck is no more. Charles Shaw wines sold at Trader Joe’s in California now cost $2.49 a bottle, not $1.99. In other words, Two-Buck has been replaced by his twin Two-and-a-Half-Buck. The fact that the price remained at $1.99 for over a decade – one of the great bargains in the history of wine and drink – is quite astounding in itself. But then, a price increase of 25% makes up in one fell swoop for the inflation that averaged 2.5% over the past decade. It’s still a bargain, but Two-and-a-Half-Buck Chuck is more of a mouthful than the old name, and I think that the affectionate name will pass out of folklore. Eggs and coffee, along with some home fries and toast, are what I’m probably going to have for breakfast this morning. But I don’t mean to write about my breakfast. I mean to write about sizes. When products are commonly available for sale in two sizes, these sizes are likely to be called Small and Large. If they come in three sizes, these are usually Small, Medium and Large. Eggs in supermarkets typically come in three sizes. But they are called Large, Extra Large and Jumbo. Yes, eggs in a carton marked Large are actually small. I am old enough to remember eggs sold as Medium, but I’m not sure about Small, though they must have existed at one time. But chickens of the egg-producing variety have been bred to lay ever larger eggs, and the ones that laid Small and Medium eggs have been bred out of existence, except perhaps on some organic farms that market “heirloom” eggs. But the USDA standard for eggs in the United States doesn’t seem to have changed, and so we live in a world where, as regards relative egg sizes, Large means small. Now, when it comes to cups of coffee in coffeehouses, just the opposite has happened. For me, a normal cup of non-espresso coffee is 6 to 8 fluid ounces (US). I would call the 6-oz. cup a small cup “small” and the 8-oz. cup (usually a mug) “big.” Also, coffee in coffeeshops (that is, casual restaurants, as distinct from coffeehouses), when served with meals or without them, typically comes in 8-oz. cups, and if customers want more coffee, they get free refills. But in American coffeehouses that are not Starbucks — at least on the West Coast — the cup sizes that are designated Small, Medium and Large are typically 12, 16 and 20 ounces respectively. (Starbucks, famously, has invented a special language for these sizes, but they seamlessly translate orders from English into this language, so that, for example, Small = Tall.) For my coffee-drinking habits, these would be Large, Extra Large and Jumbo — exactly the terminology of egg sizes! I suspect that the reason for this development is that in American coffeehouses takeout has become the default. I would guess, from my long experience of hanging out in these places, that by now the ratio between “to go” and “for here” is at least 2:1. Now, Americans like to drink their coffee (traditionally weak) in large amounts, and if they are limited to one cup without refills, they might as well make it big. And so Small is actually large. In reflecting on my post the other day (in which I waxed snide about French cooking) I realized that what I meant was “classic” French cuisine (whether haute or bourgeoise), and not necessarily the cuisine of France, which has evolved considerably in the half-century since I first experienced it and since Julia Child (and her French coauthors) first brought its gospel across the Atlantic. Unfortunately most Americans still think of “French cooking” as what Julia Child, and such other apostles as Jacques Pépin, has taught them on television and in cookbooks. I still remember hearing, from the French professor under whom I had done my postdoc at the Ecole Polytechnique, about his amazement at the salad bar that he had encountered when attending a symposium in Providence, RI, in 1962. Well, by now the buffet de salades is quite common in restaurants in France (though not in “French” restaurants elsewhere). Under what foreign influence it got there, I don’t know. What I do know is the influence on the cooking of France from her neighboring countries, whose cultures overlap into French territory. On its fringes, the population of France is, for the most part, not ethnically French. This is true in particular in the six corners of the hexagone: it’s Flemish in the north, German (Alsatian) in the northeast, Italian (Ligurian) in the southeast (Corsica is also ethnically Italian), Catalan in the south, Basque in the southwest and Breton in the northwest. What’s more, the Camargue in the Rhone delta is populated by descendants of Andalusian Gitanos (it’s the homeland of The Gipsy Kings). The cooking of these regions reflects the influences. So, for example, all along the Mediterranean coast you can find, besides the overrated bouillabaisse, some wonderful Spanish and Italian food. I still remember that, in the 1980s, the sidewalk restaurants of Port-Bou (on the Spanish side of the border on the Mediterranean) were overflowing with French gourmands gorging on tapas and paella. No more: you can now get great paella and tapas in France, at least in the south and southwest (and of course in Paris). Especially memorable is an exquisite assortment of tapas that I had as an entrée (i.e. appetizer, not entree in the US sense) at a restaurant in Montpellier in 2003. I have no recollection of the main dish. And tapas are called, in French, tapas. Traditional French cuisine has no equivalent of the Spanish tapas, the Italian spuntini, the Eastern Mediterranean meze, the Korean banchan or the Chinese dim sum/dianxin. In France, everything — cold cuts and other hors d’oeuvre, cheese, fruit, soup and fish and meat — somehow had to be crammed into the confines of a super-heavy meal. I had only one such meal in my life, in 1961 at a restaurant in Dijon. It was tasty, but overwhelming. I could not eat for 36 hours, and it killed whatever enthusiasm I might have had for la cuisine française (originally kindled, before I had ever set foot in France, by the writings of Ludwig Bemelmans and Joseph Wechsberg). But la cuisine de France, de nos jours, c’est autre chose. The relative dullness of French cooking had already struck me during my first trip to Western Europe in 1958, when I traveled through France between Spain and Italy. In both of these countries I was amazed by the variety of the food, if only by the dozens of different kinds of tortillas in the one and of pastas in the other. In France I had to seek refuge from the monotony in North African and Vietnamese restaurants, and briefly thought that maybe colonialism wasn’t all that bad. I believe that the mystification of French cuisine in the US is due to the very scant immigration of French people to this country, which meant that there was no need for real French restaurants, the kind that ordinary French people go to, to be established. This gave enterprising French cooks an excuse to serve (or to have served by intentionally surly waiters), at exorbitant prices, something that they called haute cuisine.